The Tools to Help Reduce The Overall Impact of Transportation on The Environment. Alternative transportation programs, including ridesharing, substantially reduce traffic congestion, cut greenhouse gas emissions, and can save millions of dollars in commuting and parking costs. However, matching thousands, even tens of thousands, of travelers with rides, keeping information up to date and generating the many required reports are challenging, time-consuming tasks. 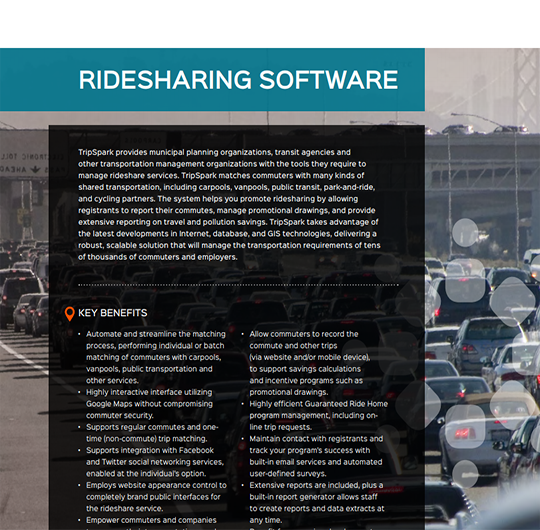 Whether you manage ridesharing for one office or an entire region, TripSpark’s ridesharing management software offers easy-to-use web-based software that manages and delivers ridesharing and other alternative commuting services. Our software solutions enable you to track and report user mode shifts from single occupant vehicles to transit, carpool, vanpool, and even walking pools. Quantify with accuracy the environmental, economic, and energy savings to demonstrate the total impact and quality of your ridesharing program. Ridesharing programs can shift fixed route usage by underserved areas. As well, with efficient data capture and reporting, you are able to reduce your staffing costs. Gamifying, incentivizing and rewarding participant behavior can increase participation in your program. Our tools allow for more advanced program initiatives. Automate and streamline the matching process, performing individual or batch matching of commuters with carpools, vanpools, bike buddies, public transportation and other services. Enhance the matching process by providing riders with profile indicators that can include multiple addresses, commuter-specific search criteria, gender preferences and more. As part of our mandate, TripSpark is dedicated towards developing integrated mobile applications to encourage participation and to make your program more attractive. Our products come with a dedication to provide responsive customer service, license-free updates and continued development to ensure long-term satisfaction. 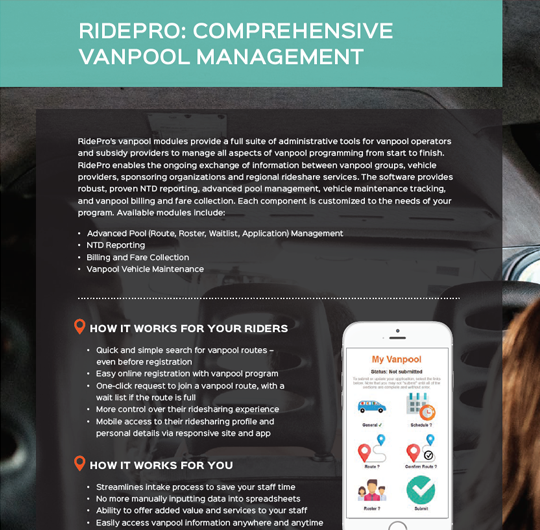 Providing the tools so your operation can offer a full service rideshare or vanpool program. Drag-and-drop dynamic dashboards and reports. Easily keep track of vehicle insurance, driver records, gas, mileage, and standard NTD reporting needs in a single database. Host your own data or let us do the work. Our hosted solution allows you to avoid costs associated with setting up and maintaining a server. 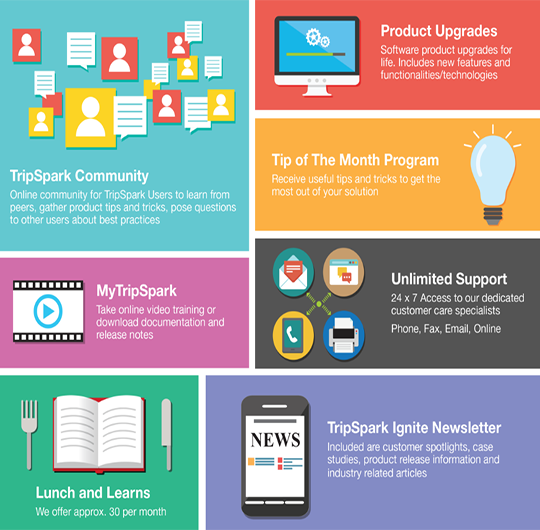 Hear from Matt Mills, Technical Support Coordinator, and Aisah Gayle, Senior Program Specialist, speak about how TripSpark's Ridesharing software has impacted their operation. Ridesharing: For Tomorrow’s Commuters, Today.